This is not really an Amish story, but “Amish” ended up in the headlines incidentally. A group of Amish boys in Hillsdale County, Michigan stumbled across a body in the woods last week. Joseph Graber, a 12-year-old boy who lives less than a mile away from the crime scene, was one of the four Amish children who discovered the body on Sunday as they were riding through the countryside. Graber said when he saw the body, he didn’t think it was real. Graber and some of his family members riding with him went back to get help. His friend, 15-year-old Lavern Eicher, separated from the group and rode back to his home to tell his family. Scary thing when you’re 12 or 15 years old. Hillsdale County and neighboring Branch County are home to around eight distinct Amish communities between them. I’ve been in the area a couple of times, and it’s not like it’s gritty urban territory where you wouldn’t be surprised by these kinds of stories. 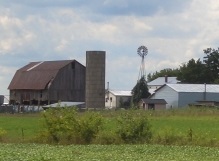 It’s small towns and rural Amish country. Yet Sherriff Tim Parker says that “We’ve had several homicides through the years…There have been some that have been a lot more heinous.” You have to wonder if drugs were involved. The mystery of what happened to this man will hopefully be solved, and the kids who had the misfortune of discovering the body not be badly impacted by it. It is sad that our changing world of violence and hate is worming its way into the Amish’s peaceful and loving lifestyle. I pray that these young boys are not overly impacted by such a violent and hateful sight. Yes, not a happy thing. I thought of the film Witness as I was reading this story. I guess no one can escape being affected (somehow) by the violence in this world. Too bad it was two kids who found the body. I hope the crime is solved soon. Just what the Amish need—crime tape in their area, and increasing publicity! The Hillsdale Collegian article has a photo showing two buggies on a farm located near the crime scene. Both are open-topped, which makes me wonder if this settlement is Swiss. The surnames of the two boys interviewed, Graber and Eicher, are fairly common Swiss surnames, though they do also occur among P.A. German Amish. One of the settlements I visited in next-door Branch Co. is Swiss. “No one else is believed to have been involved. Authorities contend the two are “fully responsible” for the homicide and there is no additional threat to the community, Parker said. Sounds like a scene out of the movie Standy By Me with 4 kids finding a body. What’s the best way to quit a bad habit?